Just like ride sharing, there are plenty of food delivery options out there for Malaysians to choose from. 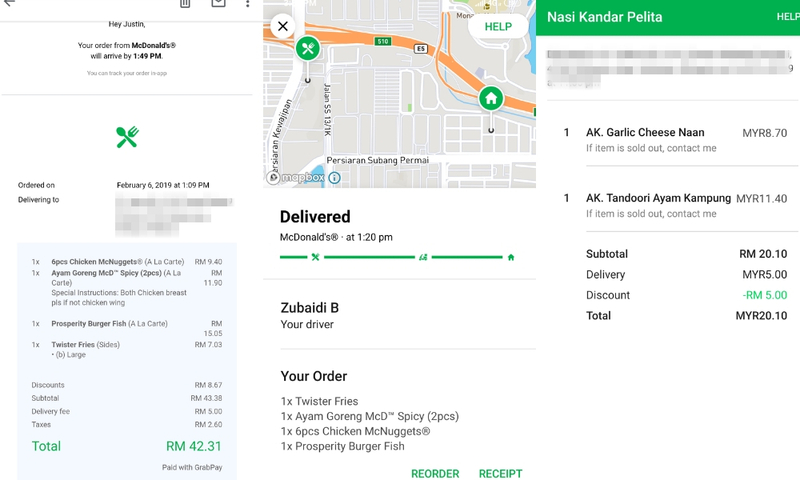 As a frequent user of food delivery services, I tested four of the main food delivery apps available in the Klang Valley and compared them head-to-head. We’ve all been there, waking up around noon on a weekend thanks to the afternoon heat. First thing you hear is probably your stomach growling as you missed breakfast and soon to be lunch. Instinctively, you head to your kitchen and open the fridge to see if there are any leftovers but you turn up empty handed. The only solution to solve your hunger, is to head outside and get food. However, thanks to the afternoon sun, you’re too lazy to even go out and grab a bite so you turn on your smartphone to find for food to be delivered. Only now you’re unsure of which food delivery app to use as there are too many. Fret not, in this article I’ll do the ordering and not so much of the delivering so you can decide which to use when you’re in a similar dilemma. I tried to order food from the same restaurant for the different apps but not all the food delivery apps cover the same restaurants, hence I’ll be taking the time taken, user experience on the platform, and the extra features offered into consideration for this comparison. Note: This is not a sponsored article, and the services are arranged alphabetically. Only 4 apps were tested based on the availability of coverage for my residential area of Subang Jaya. Founded in 2012, Penang-based DeliverEat has now made in-roads into the food delivery scene in Klang Valley. Since 2017, DeliverEat has expanded their coverage within the Klang Valley but have not penetrated the market as well as other food delivery services. 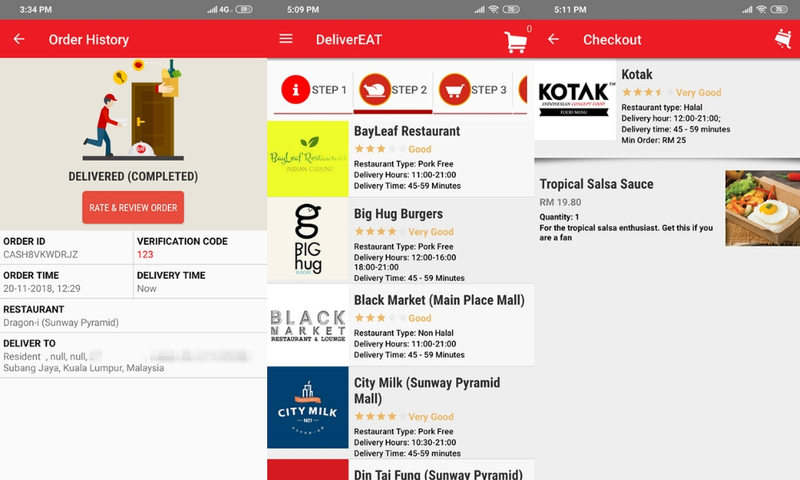 A look at DeliverEat’s app and interface. This means they might also have a smaller fleet, meaning their deliveries can sometimes take slightly longer. But for both times that I used DeliverEat, it took around 45 minutes or so for my orders to arrive. One of those times, I ordered my favourite fried rice from Dragon-i, Sunway Pyramid at 12:29PM and it came at 1:15PM. As a local startup, DeliverEat faces an uphill challenge to scale extensively compared to their competitors as they don’t have as much funding as the rest. Also, their options are considerably less compared to the bigger companies but still decent enough to choose from. Pros: Simple-to-use platform, available on both PC and smartphone devices. Cons: Smaller fleet compared to the rest, lesser merchants to choose from. Since switching up their branding from orange to pink following its acquisition by Delivery Hero in 2017, foodpanda also launched a new app and front end with added value for customers. However, I’ve only used foodpanda 4 times and after one bad experience with it, I wasn’t keen on giving them a second chance anymore. 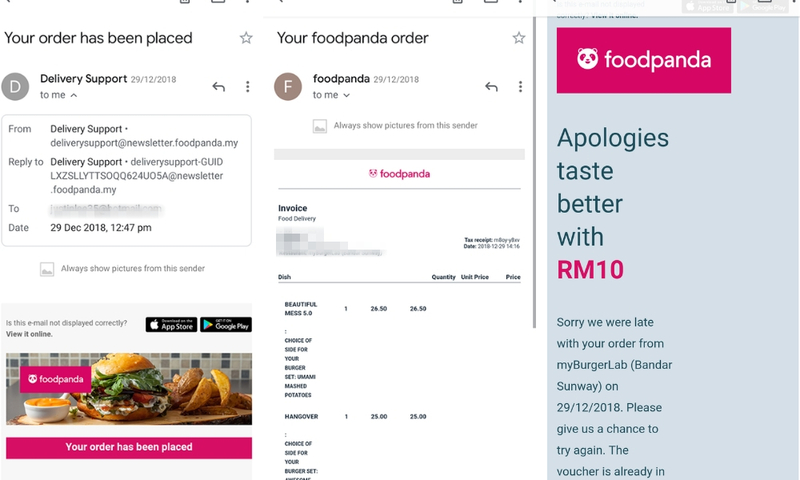 foodpanda’s delivery timing and apology email. Ordering some burgers from myBurgerLab on foodpanda, I had to wait from 12:47PM until 2:16PM; almost an hour and a half for the burgers to arrive as the rider that was supposed to pick it up ditched at the last second. Usually for food deliveries in Klang Valley, it would take 45 minutes from ordering to delivery at your doorstep. However this delivery took me so long that I almost forgot I ordered something on foodpanda and I had to personally contact their customer service to let them know about the delay an hour in. Although I was compensated with a RM10 voucher, it didn’t really help as it was only valid for two weeks and I didn’t want to go through the same ordeal again. Furthermore, foodpanda doesn’t really give vouchers frequently like GrabFood does so I’m not really encouraged to use it more. On the other hand, the plus side is that the choice of food on foodpanda can be compared to GrabFood, as both have quite a number of merchants under them. Pros: More than enough merchants to choose from, available on both PC and smartphone devices. Cons: Slow delivery speeds, for me at least. Grab ventured into food delivery after acquiring Uber in Southeast Asia and has since then established GrabFood as one of the main players in the food delivery service industry. As a frequent user of Grab in it’s entirety—including GrabCar, GrabPay and GrabFood—I appreciate that everything is integrated into one platform and payments can be done through their e-wallet, GrabPay. I’ll be honest, I use GrabFood the most and use it at least once a week, and I haven’t been disappointed with the service as it always arrives on time or even earlier than the estimated time. A look at GrabFood’s delivery timing and platform. Take for example the picture above. I ordered McDonald’s at 1:09PM which was located around 2km away only and it was estimated to take 40 minutes to arrive but by 1:20PM the rider was already waiting at my doorstep. Impressively, it only took 11 minutes in total for McDonald’s to prepare my order and for the rider to pick it up and deliver it. Furthermore, GrabFood is pretty simple to use and navigate, constantly churning out promo codes. Even though there’s a RM5 delivery charge, there’s almost always a promo code out there that can get you free delivery and sometimes even more discounts if you’re a platinum member on GrabRewards. The list of merchants on GrabFood is also pretty extensive and users can be spoiled for choice. Pros: Ecosystem for everyday needs, rewards for purchasing, and fast delivery. Cons: Only available on smartphones. 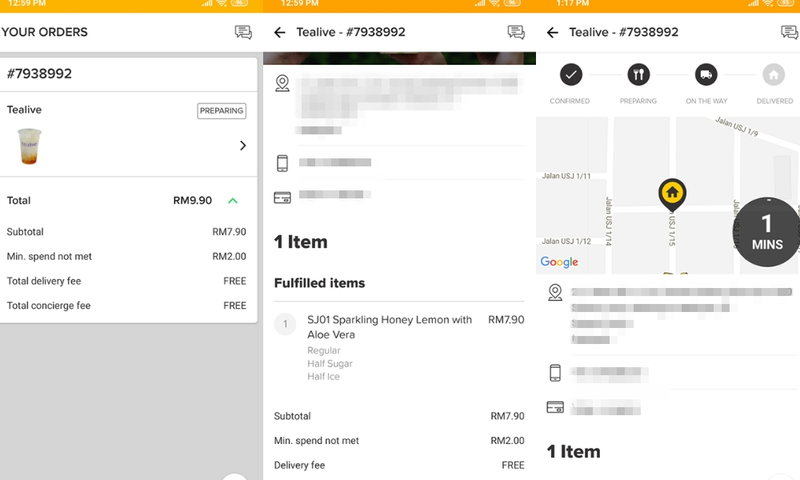 When honestbee just started in Singapore, they were only doing online grocery shopping before they decided to throw their hat into the food delivery ring. Furthermore, they’ve actually expanded their offerings from just personalised grocery shopping and food deliveries to now becoming a food discount app, where users who sign up with their beeHive membership get 1-for-1 deals when dining at participating restaurants. I’ve been a frequent user of honestbee especially for grocery shopping as my mother is too lazy to go out to the shopping mall sometimes and have also used the beeHive membership for dining discounts (my favourite part of the app). A look at honestbee’s platform and delivery timing. As for their food delivery, I’ve only tried it once and ordered Tealive at 1PM and it reached at 1:18PM, although it’s just a beverage it was still pretty quick, taking only 18 minutes. honestbee offers quite a vast service for F&B options as you can choose to dine-in (beeHive membership only), takeaway (up to 20% off), and also have your meals delivered. Furthermore, honestbee also has a service called Bungkus that only delivers food from Halal certified restaurants. honestbee worked with JAKIM and they’re the first company to receive Halal certification in JAKIM’s Halal food delivery category. Update 21/3: We’ve updated the content above to include more relevant information about honestbee’s services. They also offer a wide range of F&B merchants to choose from and it’s comparable to Grab and foodpanda. They are also currently offering plenty of promo codes in a bid to challenge GrabFood and foodpanda’s dominance in the market. Pros: Vast services for F&B from dine-in, takeaway, and deliveries. Cons: For food deliveries, if you don’t meet the minimum spending required, you’ll be charged a certain fee on top of the delivery fee. If you take into consideration all four of the apps, the best food delivery apps are the ones that offer more than just food delivery and that’s what makes them stand out from the crowd. 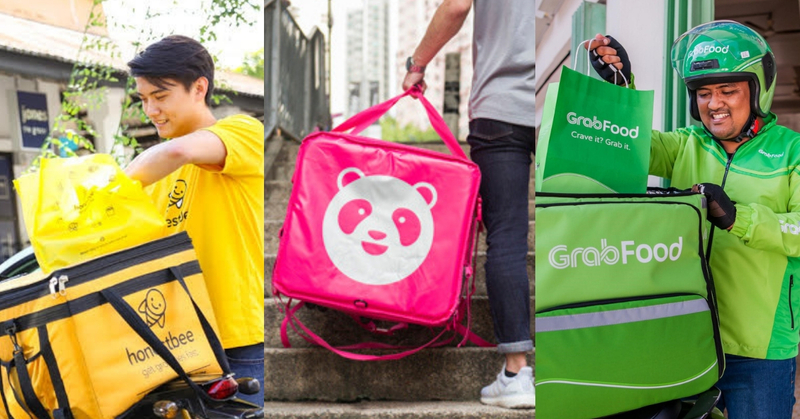 Grab has the biggest ecosystem out there as they’re on their way to becoming the ‘super app’ of Southeast Asia and honestbee is hoping to make it big in F&B and grocery shopping, while the others only do food delivery. As for promo codes, don’t expect GrabFood and the others to continue churning it out as once the market is more stable, it’ll become something similar to the e-hailing market where promo codes are hard to come by and only those who use it frequently are rewarded. If you would like to read more articles about food delivery, you can check it out here. Do Business Lunches Actually Help In Closing Client Deals? We Ask M’sian Entrepreneurs.